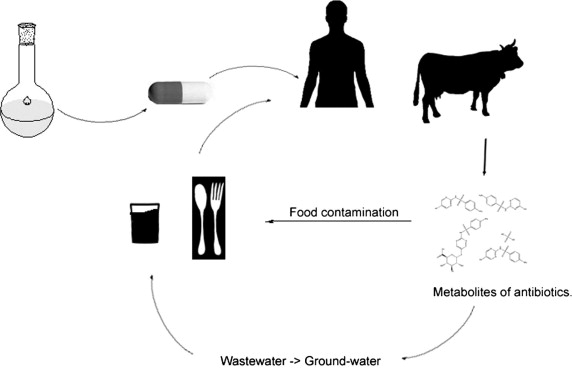 Life-cycle and environmental fate assessment of antibiotics in the environment. Antibiotics deriving from agricultural, medical and production facilties represent an emerging class of pollutants in the environment. A series of studies have been published in context with antibiotics in soil and aquatic samples and agricultural manure. However a series of questions remain in context with their degradation, biotransformation and accumulation, encompassing the food chain, aquatic and terrestrial environments as well as ground water reserves. In this context, this project aims to map the gravity of these emerging pollutants in the environment, their chemical and microbial degradation patterns, as well as measures taken in various countries to limit the degree of contamination of ground water and food sources. Keywords: Antibiotics, contamination, waters, food, purification methods, microbial degradation, transformation. Project participants: Manzetti S. and Ghisi R.
Fig. Cycle of transformation of antibiotics from production to several instances in the food chain. Fig 2. 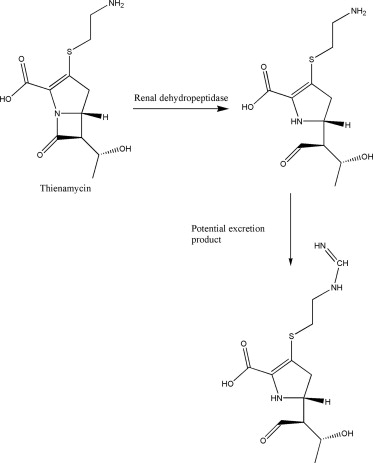 Secretion path in animals and humans of a thienamycin.